The London Hydrogen Network Expansion project (LHNE), supported by the UK government, announced two new distance records for hydrogen fuel cell electric vehicles. Apart from commercialization and start-up infrastructure difficulties, the FCVs advantage is still long ranges on a single hydrogen tank, and quick refueling abilities that take only a few minutes (when a station is available). Being able to drive 1,000 miles a day, and spending just several minutes on refueling is tempting (at least until you receive the bill for hydrogen on commercial basis we believe). Today, the UK hydrogen network consist now just four hydrogen stations. The plan for the next 12 months is to have eight moreadded - for a total of 12. 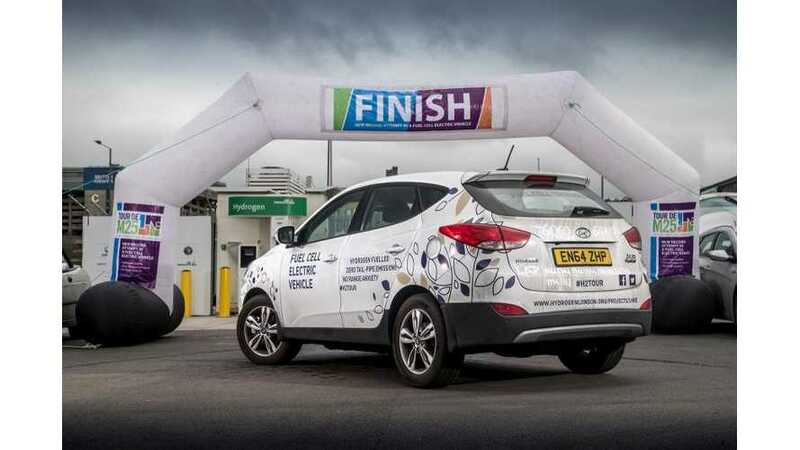 "The record was broken in a Hyundai ix35 Fuel Cell car as part of the LHNE partners’ contribution to Hydrogen Week (March 11-18), designed to raise awareness of the significant benefits offered by FCEVs and their environmentally-friendly credentials. The group of companies that comprise the project, which is led by Air Products, completed around 50 of laps of the M25 motorway, plus mileage to and from one of the four publicly-accessible hydrogen refuelling stations in the UK. Hydrogen FCEVs produce no harmful tailpipe emissions with water being the only by-product. With range and refuelling times similar to those of petrol or diesel cars, they can be seen as direct replacements for conventional vehicles. LHNE, co-funded by Innovate UK, was set up in 2012 to create the UK’s first hydrogen-powered transport system across London and the South East. It has delivered a new publicly-accessible, state-of-the-art fast-fill SmartFuel® hydrogen refuelling station and upgraded a second to 700 bar pressure status. The LHNE partners are now keen for the adoption of a range of hydrogen vehicle technologies, including fuel cells, to accelerate in the UK but one of the main challenges is the limited coverage of refuelling stations to support the vehicles. There are currently four publicly-accessible stations in the UK, including the two Air Products SmartFuel® stations in London, and funding is in place for at least 12 to be operational in England and Scotland within the next 12 months." “It is fantastic to have overhauled the two records we aimed to beat this week. The fact that we have managed to drive 6,096 miles in under a week demonstrates perfectly the viability and usability of FCEVs.